Those guys at The Register have done it again. Someone sent them an interesting Google Earth placemark which shows a satellite photo of what appears to be a flying car near a parking lot in near Perth, Australia. The Register, in their usual sensational journalistic style, have written a story which hypes the idea this is a flying car, and doesn't bother to speculate on alternatives. 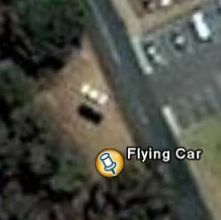 There's no question this satellite photo described with the "Flying Car" title certainly looks like a flying car. However, if I described the photo as "Black car parked next to white car in parking lot", what do you see? Here's the placemark of the location in Google Earth. I have written about other visual anomalies before. Sometimes its just a matter of how you look at a picture. Like this story? Digg it! A balloon in a shape of a car to indicate the location of the car park ? Could it possibly be a roadside stand/shed? The black portion doesn't look like a car to me, but rather the shadow of the roof. Just a thought. I'm thinking that its one of those "signs" used to indicate car sales or car mechanic's shops in which an old car is mounted on a tall pole. I've not seen that for some years, but I have seen it. It would certainly look like a floating or flying car from a satellite or aerial photography perspective. If you look at the angle of the shadows of the trees in the surroundings, you will tell that if the black shape were indeed the shadow of the car, it would not coincide with the angle of the surronding shadows. Logical thinking gets the answer. When will you focus on the African continent and deliver us some high res photos of the major cities. The national geographic sites leave us all wanting more. Please focus on Accra, Ghana and Lagos, Nigeria for starters. Thank you. The black object certainly looks like a shadow - doesn't have the structure that the other cars do. And it's in the right direction from the light object to be a shadow of it judging by the angle of the other shadows. But as it's so far from the white object then the white thing must be elevated. This Is Point Walter Reserve, a public park so I doubt it's some kind of commercial sign for an auto business. Perhaps some kind of balloon or kite?? But, it looks to me like two blurry cars are parked within rectangular white markers on the ground. You do know the article at The Register is a joke right? It's definitely a flying car.....c'mon guys! Where's your sense of adventure? I'd love to see someone show me how the angle is not right for it to be a shadow. It's fine. Especially if you grant that the car is elevated. Also, it's odd to me that this "black car" does not reflect any sunlight at all, unlike the black cars in the parking lot to the northeast. Clearly many of you are Muggles. It IS a flying car. Harry and Ron are on holiday. Something in the Register is a joke? What?? There is only one problem I see with the two car theory. That is: If I look at all the cars in the parking lot, I can clearly make out a shadow area attached to each car. They ALL cast shadows. Why does the "flying" car show NO shadow attached to it like EVERY other car does??? 1. several other black car in the adjacent lot show curves by the bending of the sunlight and show light spots where light relects off the surface. The black object in question shows NO light reflection. 2. Why are these two cars parked in this direction (angular) outside of a lot with many open spaces? I'm not saying it's a flying car ... but the "white car - black car" idea fails scrutiny. 1. If it's a black car, where's the white car's shadow? All the other cars have shadows. 2. If it's a black car, where's the reflected glints of sunlight present in other cars? I know ... it's a STEALTH car that is SO black it absorbs ALL of the light, so you don't so much see the car, as NOT see anything. 3. The direction of the "black car" is correct to be the shadow of the white car, if you compare it to other objects casting shadows in the area. I don't have a plausible explanation, but the "Flying car" theory is improbable, and the "white car / black car" theory is problematic. I'm inclined to beleive there's some photographic anomaly in play here. We need an expert in satellite photography to chip in to get to the bottom of this. The shadow of the white car is very much present, and it is consistent with the white car being on the ground. GE texture maps the photo to a 3D sphere model of the Earth, so there is just a touch of distortion. If you scale up the Google Local version of this picture the shadow of the white car is quite clear. The black car is at a different angle, so the sun doesn't glint off the windows. Also, I believe the black car is actually a small pickup, so there is no back window visible from this angle. Also, the black "truck" has a shadow as well, which alters it's shape a little making it look different. Everyone else is probably bored with this but I've only just seen it. As someone who lives about 5km away, here's my two cents worth...unlikely that cars are parked there; there's plenty of parking in the actual carpark. (You could park there if you didn't mind a bit of rough ground, but why would you bother?) Best theory I've heard, though I'm not 100%, is that it's a kite surfer; this area is used a lot by kitesurfers. if you look right beside the shadow you can see the faint white line of the sign that is casting it..
it doesn't match with al the other shadows.. just check really close .. picture yourself where the sun would be of the shadow from the 'flying car' and then check the shadows of the trees.. it is not the same direction! bars, and the bars are to small, that you can see them. All in all it looks like a flying car. Additionally the pictures are maybe 1 or 2 years old, and the advertising board could be removed yet. In my country (Germany) there was a big diskusion about the "flying car", with like 400 peoples and maybe 100 professors! This is clearly just another hoax on the part of the MIB to distract us from the really important research of the high-def 2006 Digital Globe images of Area 51! It looks a lot like a portable water tank that's used on construction sites. This picture makes me question again, "how can educated people be so simple-minded?" The angle of shadow says its from the white car, yet the proximity of the shadow says the car is elevated.... so that means there's an anomaly??? and that we need an expert in satellite photos??? Shake your frikkin' heads. The guy who vacationed in P.E.I., Canada has it right, it's a car elevated as a display...now stop making everything so damn complicated!!! I live near there. I'm going to clear this up right now. It's actually this flying car. I can't belive no one figured it out. It could be a car on a pole! Wow what a concept. There is a "flying car" a couple hours from my house. It is infact, a car on a pole. I would show you on GE but It's noon so you see no shadow. It is actually a "kite" from a kite surfer. In perth (where I live) this is a common spot for them to rig up and head out onto the river. Not sure why this person is in the carpark though, maybe learning to fly the kite ? All of you who say its a car on a pole, explain why would you have a car on a pole on this location.... those of you who say it�s a kite, explain why such a huge kite would be flown so far away from the ideal place to fly such a big kite? It is a water supply tank used to fill our dust control tanker. We were working on the south end of the road. Although I am from Sydney, I have been to this location. Sadly, this is NOT a flying car (I wish! You're all so funny! ), and no this is NOT a large sign with a ballon (these are almost no existant in Perth) even a marketing student would not place one anywhere near this low volume location. You can see the black image has no detail and it has no shadow, it is flat. It is consistant with all the shadows and it IS actually the shadow of the white car. You have to understand the lack of restraint in Perth drivers as you do with the incredible timing of Googles snap shot. If you look at the roadway, it's pretty clear this is a car that has come round the northly corner (travelling south) way too fast, lost it, corrected it and lost it again sliding sideways before flipping the car as it hit the grass which is like a gutter on this spot. This is a common thing, specially with P plate drivers (provisional 1st year licence holders). Perth drivers are amoung the worst in the western world and most get their licence from the mornings ceral box. If you can ident the date of the photo & cross reference it with a local newspaper I belt you find out whose in the drivers seat. All from a Google image! Coooool!!! I think that it is the car of "return to the futur 2"! Certainly, why not! Come on people. Ok all you European/North American etc etc. Listen to the people who live there!!! There is no billboard/structure there. The guy who said it is a mobile tank for refilling dust suppression trucks has nailed it. Oh god. Already the Harry Potter Fans are attacking. Anyways, when I first saw this I thought that a pole or something could be underneath the car to rise it off the ground to cast a shadow like that. But the "black car being parked next to the white" is pretty logical too.